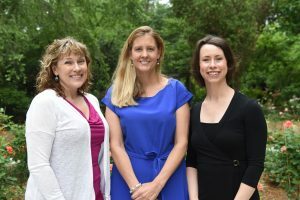 Hospice Savannah is fortunate to have three incredible full time doctors at the helm! They work closely with your, or your loved one’s, personal physician to ensure all medical needs are expertly and promptly addressed. From left to right they are Dr. Cynthia Carter, Dr. Julia Johnson and Dr. Laura Farless. Dr. Julia Johnson is a board certified Hospice and Palliative Medicine physician who works with our personal physician to make sure you or your loved one receive the highest quality pain and symptom management. She has been involved in the care of end-of-life patients since 2011. Julia graduated from Bryn Mawr College in Philadelphia and later received a Master of Public Health from Tulane University. She attended Brown University School of Medicine in Providence, RI, and her primary certification is in Family Medicine. She is very involved in education and is on the faculty of both Mercer and Medical College of Georgia medical schools as a Clinical Assistant Professor. She is Chair of the Ethics Committee of Hospice Savannah and a member of the St. Joseph’s/Candler Ethics Committee. Dr. Cindy Carter is a board certified Hospice and Palliative Medicine physician who, like Dr. Johnson, works with your personal physician to make sure you or your loved one receive the highest quality pain and symptom management. She visits patients in their own home, nursing home or assisted living facility as well as at Hospice House. She has been involved in the care of end-of-life patients since 2005. Cindy graduated St. George’s University School of Medicine and her primary board certification is Family Medicine. She was an academic physician for four years and continues to serve on the faculty of both Mercer and the Medical College of Georgia medical schools. Dr. Laura Farless is a board certified Hospice and Palliative Medicine physician who works with your personal physician to make sure you or your loved one receive the highest quality pain and symptom management. She has been providing palliative care with the Steward Center since 2013. She sees patients throughout St. Joseph’s and Candler Hospitals and sees outpatients in the Palliative Care Clinic housed in the Nancy N. and J. C. Lewis Cancer & Research Pavilion. Laura graduated with a BS from Tulane University and went on to receive her medical degree from East Tennessee State University’s Quillen College of Medicine. She completed an internal medicine residency and palliative medicine fellowship at The University of Alabama Birmingham where she served as a faculty member in the Division of Geriatrics and Palliative Care before moving to Savannah. Laura is an assistant professor of both Mercer and the Medical College of Georgia medical schools.